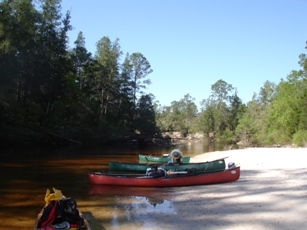 Baker, FL--The usual April Fellow Traveler adventure was a twenty-mile paddle on Florida’s Blackwater River. The meeting place was the Cotton Bridge on SR 4 just west of Baker, and the time was set for ten in the morning on April 8, 2010. Rookie Adam O’Quinn, John Williams, and George Royal all arrived very early, Donald May rode over with Charlie and Diane Stines and arrived about twenty minutes early. Sam Brown followed them from Thomasville. Art and Janice Shelfer were on time, but Greg B aker was a little late although he had some less than convincing excuses. 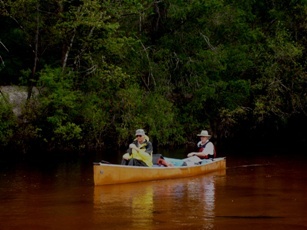 After shuttling most of the vehicles to the Blackwater River State Park the ten paddlers were ready to launch in the rain. John and Adam soloed but everyone else partnered with another. Diane brought her Yorkie, Ami, so she would have some pleasant company in the canoe. Donald begged a ride with Greg in his Wenonah Sundowner. Art and Janice used the Canadienne and George and Sam manned the Penobscot 16. The Blackwater is a shallow, twisting stream with only minor obstructions. There were no pullovers or float unders the entire trip but there were plenty of obstacles such as stumps and remnants of downed trees to dodge. The river is fed by a large number of creeks and branches. The current was pleasantly fast. The weather forecast called for rain on Thursday and the trip’s beginning was blessed with a fair amount of it, but there was no lightning and no high winds. The temperature was pleasantly warm. 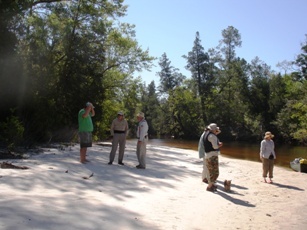 After paddling in the on-again, off- again rains, the travelers stopped for a snack break on a nice sandbar. The dog enjoyed the freedom. 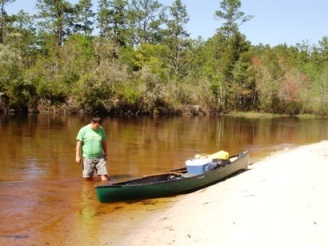 The trip was to be relatively short so no one was in a hurry to man the canoes, but eventually it was downriver again. Around two in the afternoon the paddlers found a godsend. Okaloosa County is constructing a park at Wilderness Landing. The park was not finished but it did have several covered shelters with nice picnic tables. The park had new bathrooms but they were not opened. However, there was a nice clean porta-john. After a brief discussion everyone agreed that it would be a fine place to spend Thursday night. So it was done. After eating a good lunch the campers pitched the tents and built a good campfire. The rains had stopped and the sun was shining. There was no bug problem. There were no community meals but there was a good bit of sharing. Adam cooked steaks. Diane, Charlie, and Sam ate fried quail and had enough to share some with Donald and Greg. John prepared his meal in his Dutch oven. No one is sure what Art and Janice ate. After supper it was time for campfire tales and lies. Adam, the rookie, was spared the town drunk story even though he claimed to want to hear it. Finally, everyone went to the tents for a night of sleep. It was beyond cool. Friday morning began with breakfast and coffee. Charlie made a pot of twenty cups which was not nearly enough so another half pot was brewed using the same grounds. It was not too bad and it was hot. After that, there was more sitting around the fire. Finally the ten paddled off sometime during mid-morning. Friday’s trip was much like Thursday’s but considerably longer. There were stops at pretty sandbars. The canoeing was easy and rather fast. There was a long lunch stop at Bryant Bridge. By about four the sandbars had become scarcer and the GPS was indicating that there was not a lot of river left before take-out. Adam was leading the pack and came upon a huge sandbar of clean white sand. It was the ideal campsite. The sun was somewhat hot so John and Adam erected rainflies for shade. The tents were erected, a fire was built, and then it was supper time. Once the gang was fed it was time for more intelligent conversation around th e fire. The night was again cold but the fire was just right. No one went to bed early. The campsite was not totally quiet because four-wheelers could be heard in the distance and there was the distinct sound of coyotes--illegal immigrants in Florida. Once daylight came, the campers arose and prepared breakfast. Since there was only about three miles of paddling left the departure was rather late. It took only a little over an hour to reach the state park where the canoes were unpacked and loaded. John sustained a nasty sprain getting his canoe out of the river and went to the emergency room for treatment. Sam and Greg were shuttled back to Cotton Bridge to get their vehicles and everyone headed east. It was a rather short trip for three days but most of the paddlers found that a favorable experience. Adam was a fine rookie. Although Sam has been with the Fellow Travelers for a couple of day trips, this was his first overnighter with the group.